iI have recently bought the new Apple iPhone 3G. It is an incredibly sophisticated piece of technology which has many useful applications. I will cover here all those applications and technologies found in the iPhone which can be usefull for Astrophotography and Astronomy in general. I have used all these applications and find them very usefull, taking into account that they are available INSTANTLY and ANYWHERE (the iPhone is small and light). They are of course not intended to replace your PC Plantarium program but simply to complement it. I really find the iPhone together with these applications very useful. Simple but very usefull planetarium application. It's main asset is that scrolling around the skymap is very smooth and quick. You can choose what magnitude stars will be visible (moving the bar in the screenshot). When you place the white circle (with your finger) on a star, on the left you can see the name of the star, it's magnitude and distande. 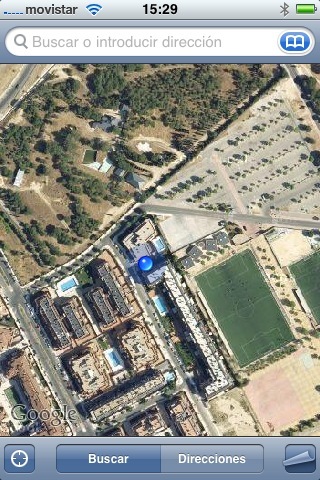 On the right you can see the coordinates (az., el. and zm.) 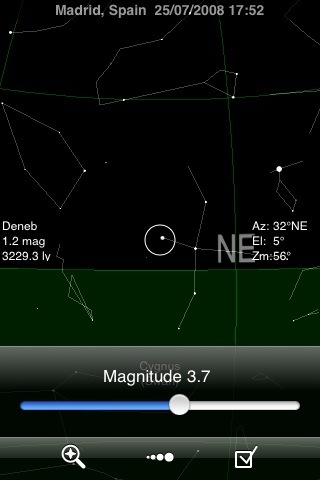 and on the bottom of the screen, the constellation to which the star belongs. The current horizon is also visible. In the Settings page you can use the built-in GPS to automatically put your location, date and time (or enter it by hand). 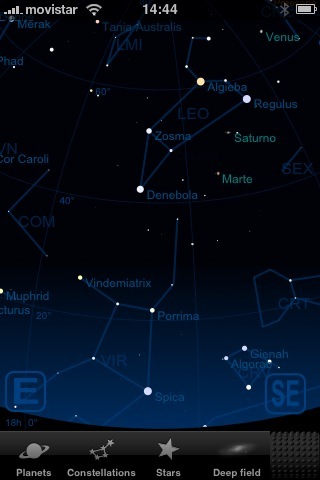 You can also choose to show on the skymap the Ecliptic, Azimutal Grid, constellation lines and/or bounderies and/or images. 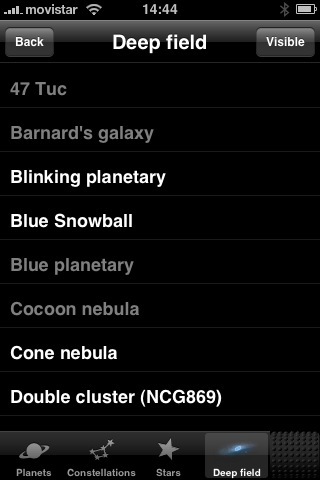 On the Find page, you have three options: Planets, Constellations and Stars. Selecting any of these objects and pressing GoTo locates them quickly on the skymap (the data base includes a few thousand stars of which several hundred are named). No deep sky objects are included. 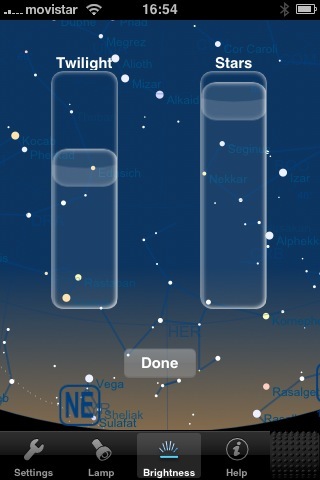 Lastly, it uses the iPhone's built-in accelerometer to show you the part of the sky you are looking at as you tilt the iPhone (North-South wise). In conclusion, although a bit limited (especially the absence of DSOs) it is -in my opinion- the most useful application reviewed, together with Starmap. This application has many more features than GoSkyWatch and the slow screen refresh rate problem has been completly solved with the 1.2 update. Now scrolling is smooth and very responsive. Moreover, a PRO version has been announced which sounds excellent (adds many features similar to applications such as The Sky). In the Navigation menu, you can also choose to see an Azimutal or Equatorioal grid, celestial equator, ecliptic and cardinal points. In the Stars menu, you can show the star's name, color saturation, limit the magnitude visible, show the Milky Way and Constellations and their names. Starmap has a database of 110.000 visible stars; 250 main stars have their names shown on the skymap together with the Constellations to which they belong to (with info on magnitude, spectral class, distance, RA and DEC). Finally, two other menus are available: Ephemeris (you can view information on position, rise and set time, altitude, coordinates, etc. on all Planets, including the Moon). The other menu is Meteors which lists all (or only currently visible) Meteor showers with information on strength, Constellation and dates when they are visible. With the new update, the application has highly improved ranking as one of the best Astronomy app currently available for the iiPhone. I highly reccommend it. 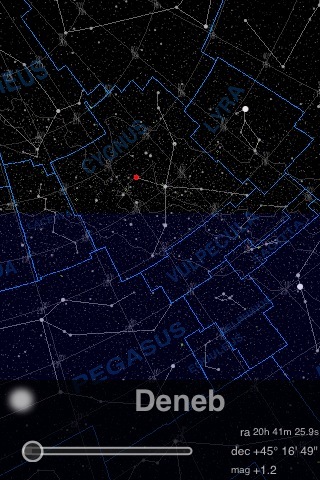 This is how Starmap shows the sky. You can zoom in/out in the usual way (by pinching the screen). 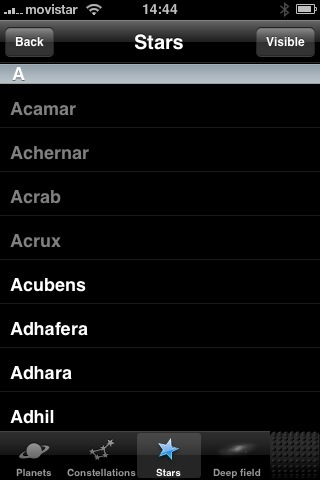 Main star names, constellation names, azimutal grid, planets and cardinal points are visible (if selected in Settings). Another cool feature is that you can change the appearance of the sky with two onscreen controls: the left one changes the lightness/darkness of the sky and the right one shows more/ less stars. 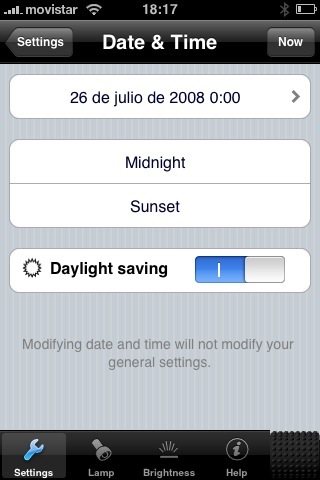 As with the previous application, in the Settings menu you can use the iPhone's GPS to auto-locate your position, time and date (a cool feature is that you can choose to see the sky at Sunset, Midnight or Now, to plan your observation or imaging sessions). 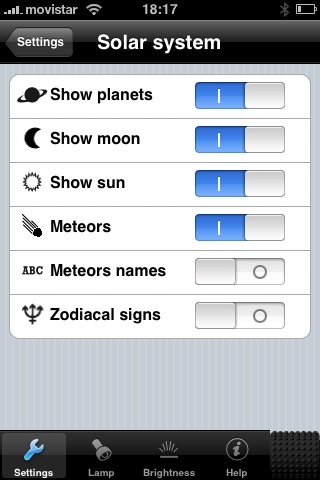 In the Solar System menu you can toggle the view of Planets, Moon, Sun and Meterors. In the Stars menu you can choose wether to see a list of ALL stars in the database or only the VISIBLE ones at this time. When you choose a star, it takes you to the skymap where a yellow arrow points towards the position of the chosen star. A double tap on the arrow takes you directly to the star. You can also navigate to the new position by scrolling with your finger as the arrow points to the right direction. The Deep Sky Obect database is quite small (only 150 DSOs). As with the Star menu, you can choose to see only the VISIBLE ones or ALL. This application has a very different approach from the previous ones. 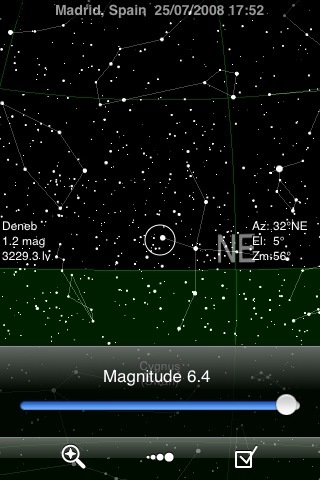 It shows the complete sky dome, with no reference to the place of observation. You therefore need to know your way around so as not to get lost. Moreover, the screen refresh rate as you scroll is very slow. I find this application the least useful one of the three. Thousands of stars are visible, together with Constellation lines, names and bounderies (the latter quite annoying since they cannot be switched off). If you tap on a star, a red dot appears and the coordinates and magnitude of the chosen star are shown at the bottom of the screen. If you double tap on the screen, you get a zoomed-in view of the sky. 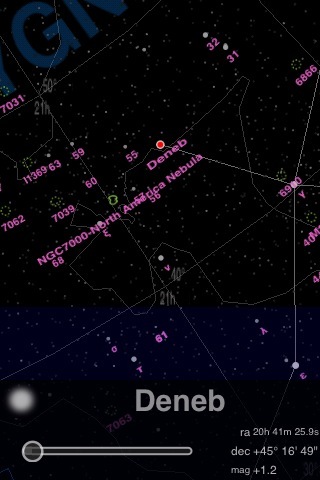 Many more stars and DSO are visible now (many labelled with their name or catalogue number). This application provides access to a VNC Server. You can connect your iPhone to a Windows PC or Mac OS X and see the screen, files and resources of the other computer. 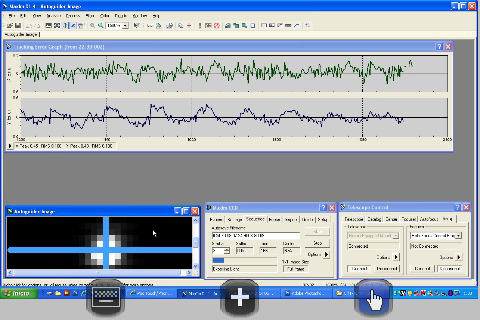 I have installed TightVNC on my Windows XP laptop (a free Windows VNC Server) and was able to connect my iPhone with the laptop on the first try after entering only three parameters. It works great! As you can see on the screenshot on the left, I can monitor MaxIm DL from anywhere in my house (or garden) to check everything is going right (you can zoom in/out very quickly and view your autoguiding graph or your current imaging status). Excellent application! Although this application is not directly linked to Astronomy or Astrophotography, it can be very useful in certain circumstances. With Maps you have Google Maps AND your current position shown on the map (satellite view, map view, or both) thanks to the buit-in GPS reciever and to the 3G connection (download of the maps is very fast). This is not a navigator (although it can calculate point to point routes), it is actually better than a navigator! For example, you can see a satellite view of a new observation site you have just found, save this location on your iPhone and calculate the route back home! It can also find for you (and guide you to ) POI (such as gas stations, hotels, restaurants, etc.). Very useful and cool application!